what-i-found: Huaraches - The Sandals That Made Mexico Famous. You know I love me some ads, but this has to be one of my favorites ever. 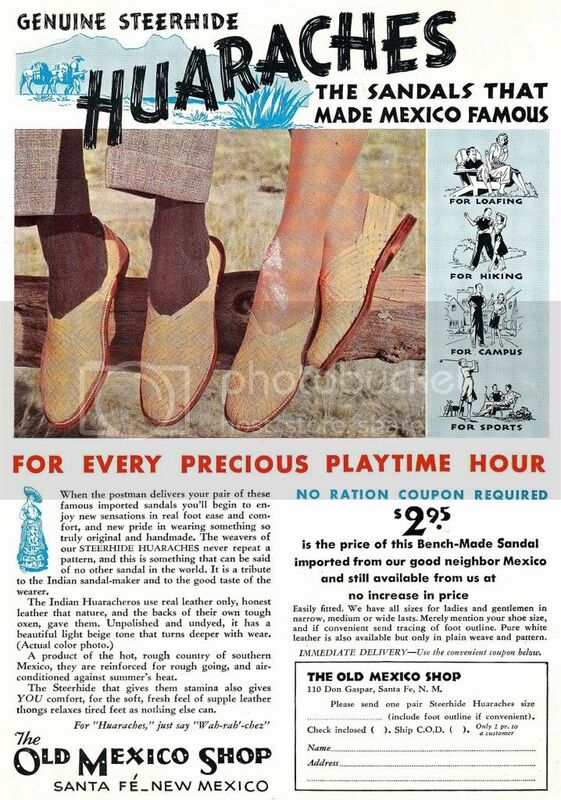 From Glamour Magazine, April of 1943 this ad is for Huaraches "for every precious playtime hour" to be ordered from The Old Mexico Shop which was in business in Santa Fe till 2009. Don't miss the ad copy here. It's an example of fine advertising at it's best. Just remember For "Huaraches, "just say "Wah-rah'-chez". When the postman delivers your pair of these famous imported sandals you'll begin to enjoy new sensations in real foot ease and comfort, and new pride in wearing something so truly original and handmade. The weavers of our STEERHIDE HUARACHES never repeat a pattern, and this is something that can be said of no other sandal in the world. It is a tribute to the Indian sandal-maker and to the good taste of the wearer. A product of the hot, rough country of southern Mexico, they are reinforced for rough going, and air conditioned against summer's heat. The Steerhide that gives them stamina also gives YOU comfort, for the soft, fresh feet of supple leather thongs relaxes tired feet as nothing else can. For "Huaraches, "just say "Wah-rah'-chez"
$2.95 is the price of this Bench-Made Sandal imported from our good neighbor Mexico and still available from us at no increase in price. Easily fitted. We have all sizes for ladies and gentlemen in narrow, medium or wide lasts. Merely mention your shoe size, and if convenient send tracing of foot outline. Pure white leather is also available but only in plain weave and pattern.